DAZN DEUTSCHLAND is a sports streaming service available in Germany, Austria and Switzerland. 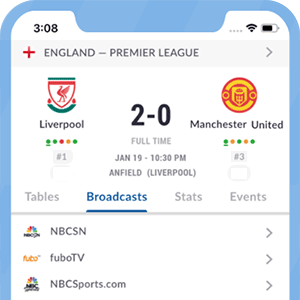 The service offers access to an extensive lineup of Soccer competitions such as the English Premier League, La Liga, Serie A, Ligue 1, Bundesliga, Bundesliga 2, Copa del Rey, Carabao Cup as well as other sports such as NBA, NFL, NHL, MLB Tennis and more. DAZN DEUTSCHLAND offers HD quality streaming and provides video on-demand as well as access to video highlights of select events for up to 30 days. DAZN DEUTSCHLAND is available for €9,99 per month. New customers can enjoy the first month free. *Got itLive Soccer TV does not provide DAZN DACH live streaming. The information provided on this page is simply DAZN DACH soccer TV schedule.